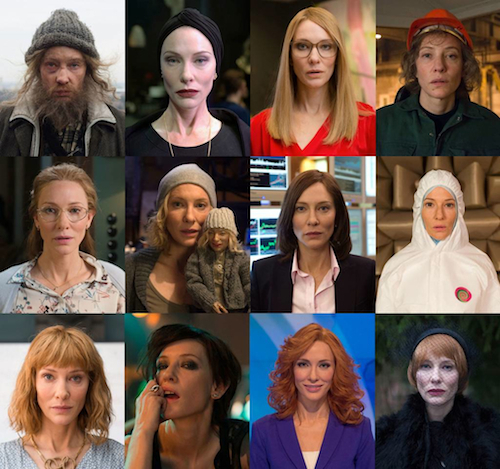 Julian Rosefeldt, Manifesto, 2014–15, thirteen-channel HD video installation, color, sound, each 10 minutes 30 seconds. Julian Rosefeldt presents a thoughtfully crafted installation of thirteen videos from 2014–15 that run in tandem across a large open-plan room. Titled “Manifesto”—a word characterized by “appellative language, militant provocation, and often propagandistic self-promotion,” as the introductory exhibition text emphasizes—the exhibition features a collage of politically underpinned treatises by philosophers, artists, architects, choreographers, and filmmakers from movements such as Futurism, Dadaism, and Fluxus. These urgent diktats are all channeled through Cate Blanchett via the videos’ thirteen versatile characters. Using different oratory styles, she delivers impassioned speeches that should, ostensibly, be awkward to recite, but the stirring words are believable when coupled with quotidian situations. Blanchett transforms into a range of prismatic figures—stockbroker, factory worker, puppeteer, funeral speaker, rocker, and choreographer—whose recognizable milieus endow the texts with new meaning. Switching out the agitated male voice these manifestos are associated with for a more affecting delivery, Blanchett mainly plays women, though she also embodies a homeless man spouting anti-elitism from manifestos by Aleksandr Rodchenko, Lucio Fontana, and Guy Debord. Elsewhere, the actress reels off media rhetoric as a TV anchor and announces excerpts from texts by Sturtevant and Sol LeWitt as though they were “breaking news,” followed by banter with a field reporter about conceptual art. In another film she’s a schoolteacher roaming the classroom, quoting passages by filmmakers Dziga Vertov, Werner Herzog, and Thomas Vinterberg, which her young pupils dutifully echo back. Each piece features a moment when the main character faces the viewer in direct address. Coming together in brief but perfect confluence, the thirteen manifesto-films harmonize, their diverse content and pitch suddenly a mellifluous hum.